Thunder In The Night: "We'll not risk another frontal assault. That rabbits dynamite!" "We'll not risk another frontal assault. That rabbits dynamite!" Ah, the great British institution that is talking about the weather. This weekend it appeared justified as a large low pressure settled over our part of the world and while the OMM competitors were dealing with this (!) 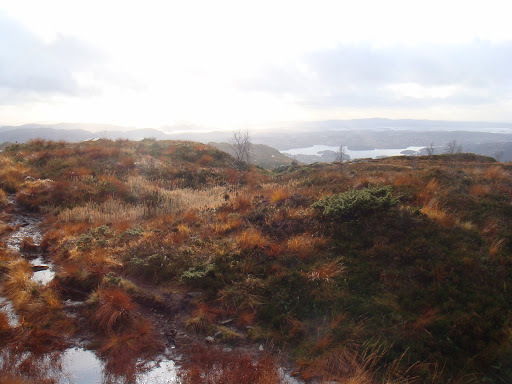 on that side of the North Sea, the citizens of Bergen, Norway were mourning the loss of hundreds of umbrellas as driving rain and gale force winds stampeded into the city and promptly got corralled by The Seven Hills. We went out for a Vietnamese dinner last night and the city's litter bins and streets were strewn with the skeletal remains of umbrellas, torn nylon flapping in the wind like shredded skin. The weather was slightly better this morning so a quick jaunt around the ol' backyard was in order. 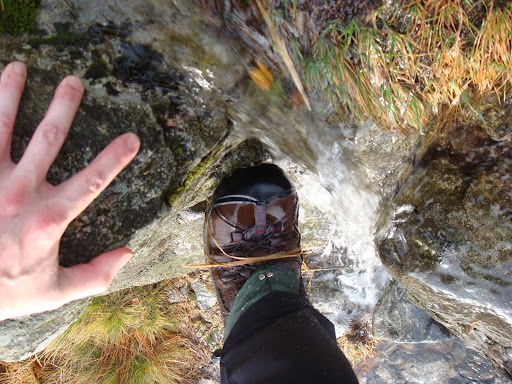 I donned waterproof mids and wee gaiters and was thankful as practically every path up onto the main ridge was running water. The little scramble pitch pictured above is normally dry, grippy granite but today it required a bit of concentration as a stream had appeared down the middle of it. Up on the plateau the wind hurled sheets of hail sideways at the few souls brave/stupid enough to be out today. Then a moment of magic. As I cowered behind a small cairn for shelter and pulled my Flux on a Mountain Hare in full winter pelage appeared in front of me and bounded effortlessly away from me in the terrible conditions. Obviously I need to work on my camera quick draw as my fingers were still fumbling with the Trio's zip as the Lupus loped away. Been pretty wet here too. What mids are you using? BTW I am still envious of your backyard. Nielsen - my mids are Keen Targhee II's. I'm pretty happy with them. They have a very 'roomy' fit, especially in the front which makes them especially useful when you need thick wool socks and a Coolmax liner in the winter. They're fairly lightweight but have a good 'bomber' feel about them with the extended rubber toe 'bumper' allowing me to charge through stuff rather than pick my way round things like I do in my Inov8 trail shoes. The eVent lining has kept me dry so far. They are however let down slightly by a fairly shallow grip and a rubber compound that isn't as confidence inspiring as the Spiderman-style-grip Inov8s. The 'backyard' has been getting a lot of my attention recently, especially as we are trying to get by without a car at the moment. There is still plenty to explore and I found a couple of new paths that are pretty cool, plenty of scrambles and good views. I'm planning some camping trips up there as soon as I get a new tent. It could be a bit cold up there under the tarp!